THIS TABLE IS SO HEAVY!! The chairs and table look and feel as if they are more expensive. The finish in person is lighter than I had expected but looks great as the whole product was assembled. 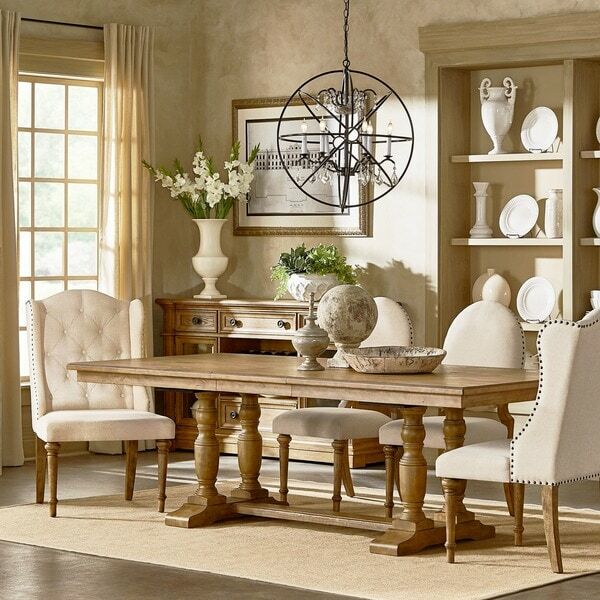 Create a custom farmhouse dining room with the versatile Gilderoy set by iNSPIRE Q. The expandable oak-finished wood dining table features a trestle base that is complemented with beige-upholstered chairs with bronze nail head trim. Choose from five set sizes that all include two removable leaves so you can host large family dinners in rustic style. 5-piece set ships in four (4) boxes. 7-piece sets each ship in five (5) boxes. 8 and 9-piece sets each ship in six (6) bpxes. Beautiful dining set! Got many compliments! I love my new dining room set, unfortunately I can only give 4 stars due to manufacturing defects of 2 of the middle chairs. The seats did not have all screw holes and the back end of the chairs didn’t line up with the cushion seat drill holes. I contacted customer service and they were happy to reorder me 2 new chairs. The assembly of this dining room set was somewhat challenging, the wing back chairs where the hardest to assemble and it took 3 people. If all my pieces were assembled I would have given 5 stars. I can’t wait until my other 2 chairs arrive. 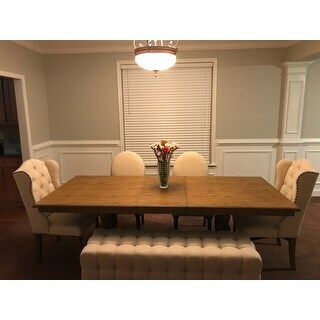 The table itself is exactly pictured, I would give 5 stars, however the hardware was missing to assemble the table. VERY frustrating. I called Overstock, and while the rep was extremely polite and understanding, she had to outsource my problem with the freight company. Instead of being able to just transfer me, she had to put in a request for them to call ME. It's been 24 hours (claimed 1-2 business days to hear back), and still no call. So, my table sits in pieces in my floor. So, LOVE the table, but I would never order such a large piece with out assembly included online again. Exactly like the picture very easy to install showed up on time! I will start by saying I did not have an option for in home delivery when purchasing. The table showed up with one man delivering and one box was completely falling apart. As far as we could tell nothing was damaged. We took out the items from the destroyed box and the delivery guy just watched not offering to help. He did not call 30 minutes before delivering like he was supposed to and when he arrived he said he couldn't make it up my driveway. My brother had to come with his truck to load the items to bring them up my driveway. Needless to say I will not order any other furniture without the options for in-home delivery. The chairs are beautiful but have to be put together. 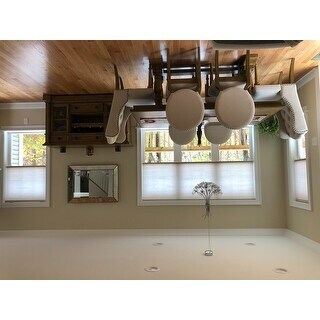 Some of the chairs are not level. I just love the chairs so I think I will enjoy the table. I absolutely love this dinning set. It is all I wanted and much more than expected. When I initially received this set, the table was damaged. Right and there I called overstock and refused the table top. Since then the overstock personnel has been so attentive and helped me navigate thru all the hardships of an oversize return. This set was my first online order ever, and I have been so far so impressed with the quality of this set, plus the attentiveness of the overstock customer service personel. Color is nowhere close to the picture. Much more yellowish/greenish. Put a wingback and side chair together before we looked at the table and they are awful to assemble. Instead of you being able to to twist the screws with your fingers until they get close and then you fully tighten them with the Allen wrench, you basically have to do the Allen wrench the whole time. Takes an hour to do a chair because of this. 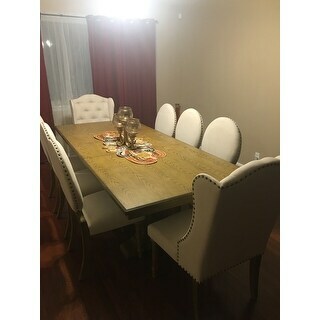 Chairs look great when assembled but table being so far off in color and chair assembly make this a 1 star and it is getting returned. Hoping overstock does well as I’ve seen in the other reviews. Exactly like photo!! It was painful to put together but worth it because of the price. I LOVE it! After my delivery date was set. My husband hired a neighbor to install due to the lack of white glove service. the company never showed up. then I received another date, still no show. Got a call that said pieces were missing. Spoke to several reps from Overstock, one guy was so rude to me. I was in disbelief. It finally came and it was chipped in several places on the table. I was so disappointed. Such an elegant, classy, unique pieces for our formal dining. So love it! Easy to assemble. Neutral color. Even my husband loves it! A friend of mine even wanting it beforehand! I love my Dining Room Set it makes a statement when guest come over, beautiful fabric on the chairs. Only regret is we should have paid to have it assembled, too many pieces to put together. easy to assemble and solid pieces. I have been using the set for almost a year now and can't find anything that i don't like about it. stylish and chic, a very successful purchase! Amazing set! Looks really good! Took a few hours to install but overall a beautiful set. Love this table and it is durable and matches so good with the buffet! We absolutely love this table and couldn’t be happier with it! The price is so affordable. Love how big u can make it, can fit up to 12 people!!! Absolutely gorgeous!! Exactly what I was hoping and looking for!! Thank you! The set is BEAUTIFUL. The assembly needs some muscle ( with 1 very handy person and 1 non-so handy = 2 full hours). The bench is a different fabric and slightly different color so be aware of that. "What’s the weight capacity for the chairs?" The recommended weight is approximately 250 pounds. "When can I order this table with BENCH and 6 chairs ??" The 8-piece option currently has a limited quantity in stock. "What size is the table without the leafs. " The table without the leaves measures approximately 76 inches long x 42 inches deep x 30 inches high. "Hello, Is it possible to purchase just the wing back chairs and bench? if so how much and how much for three of the other chairs in the picture. Can you give me a price for two wing chairs and bench with three of the additional chairs from the picture? also how much for just two wing chairs and bench. Thank you so much I am very interested. " The wing back chairs are currently out of stock. Once they become available again they will be sold as a set of two under item number 24628267. The bench is available separately under item number 20522672. "Is there an item number for the table in the back of the picture to complete the set? It looks like it matches the table perfectly. " The matching buffet table is available under item number 24359995. "Is it possible to buy wingback chairs separately, when they become available ?" Yes, when they become available again they will be available as a set of two under item number 24628267. Sorry for the delay, the wingback chairs are expected to be back in stock in early March. They will be available separately and with the set. "When will you have some wingback chairs for this set?" We do not currently have an estimated restock date. Sorry for the delay, this set is expected to be back in stock with the wingback chairs in early March.